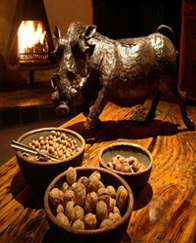 Granny Mouse House, established in 2001, is Hogsback’s premier owner- run Guesthouse. Conveniently situated in the tranquil and most easily accessible part of this charming semi-alpine Mountain Village, we cater for adult guests in a sophisticated, yet relaxed country atmosphere. WELCOME. The winding road from Alice takes one steeply up the pass and quickly back in time to a place which still echoes the thoughts and tales of JRR Tolkein. Bed & Breakfast accommodation is offered in 3 double en-suite rooms, all with private pool and garden facing patios. For couples requiring more privacy, 2 fully equipped and serviced Self-Catering units are available, located in the large landscaped garden. Located just outside the village centre, Granny Mouse House is the ideal base from which to explore what Hogsback has to offer. The Indigenous forests inspire reverence; you may find yourself whispering. The mountain vistas are awesome; you may find yourself speechless. The waterfalls are humbling; you may find yourself communing with your Maker. The thin air and stillness will ensure you as many nights’ good sleep as you make allowance for. It is a place which, once visited, may induce you to return again and again. It is a difficult place to leave. We invite you to come and experience our little piece of paradise. Ingrid, author and raconteur, will gladly share with you her wealth of knowledge, depth of conversation and passion for life. The 2 Ridgebacks and their cat have their own fan Club. We welcome you as a guest and hope you leave as a friend. Granny Mouse House, although renamed in 1998, is one of the oldest of Hogsback houses, originally built from wattle-and-daub as a private holiday home. It was later extended in all directions in an architecturally ‘interesting’ manner, and became the private residence of a rather feisty old lady, probably not too unlike the present owner. ERF number 1, now known as Granny Mouse House, was the first piece of ground subdivided off the original Summerton farm and still borders the remnants of it. The Summerton brothers, both market gardeners from England, settled in Hogsback in the 1820’s, and both married local Black women. Many of the nut trees, orchard varieties and berries still growing in abundance on the mountain bear witness to their trade. The house, purchased with the intention of providing a retirement haven for the current owner may well not have lasted until that date, such was the state of disrepair. But fate conspired as it sometimes does, to allow for earlier occupation and restoration. ‘Coming, ready or not’ was the battle cry of said ex-Capetonian new owner of Granny Mouse House. The Guesthouse has been converted over time into its present form with distinctly more love than money. No matter. It is what it is. Quaint ‘Sophisticated Squonk’ might aptly describe it and a satisfyingly large proportion of our Guests love it, if the comments left in our Guest Book are indicative. The 3 individually furnished double en-suite guest bedrooms, featuring original artworks, all have covered private pool and garden facing patios. Tea/coffee stations, a small bar fridge (stocked with fresh milk daily) and fresh Spring water, are provided in each. Bathrooms are stocked with complimentary toiletries. Each room contains a top of the range bed or beds with electric blankets and quality duck down duvets. Bedrooms are strictly non-smoking. Guests are encouraged to immerse themselves in the peace and tranquillity on offer and engage in the healthy and robust pursuits that make the Hogsback experience so special. Some noteworthy gardens may be visited in certain Seasons. Our own is designed for year-round interest. Sports fans are catered for at the Pubs which have large flatscreen TVs installed and they will sell you cold beer and love to shout along with you, regardless of whom you support. Wi-fi is available when weather conditions permit. Mobile connectivity is surprisingly good. Please note, we do not accept children under 12 years of age at our establishment. A 50% deposit (non-refundable) is required on confirmation of the booking. Balance payment is due upon arrival. Standard industry cancellation fees apply. Should cancellations become necessary, request for refunds will be evaluated on their own merits. Complimentary tea, coffee, biscotti. Fresh milk stocked in bar fridge, unlimited Spring water supplied daily. Rooms 1 and 2 are adjacent, both under open thatch. Full English breakfast personally cooked to order, by owner! Complimentary tea, coffee, biscotti etc. Fresh milk stocked in bar fridge, unlimited Spring water supplied daily. Rooms 1 and 2 are adjacent, both under open thatch. This room has a separate entrance, semi-detached from the main house and is furnished in a more modern soft french-white theme. It is under ceiling, recommended for those who may suffer from allergies. Complimentary tea, coffee, biscotti etc. Fresh milk stocked in bar fridge. it has a private patio and braai facilities, en-suite with gas-powered shower. Back-up cadac gas cooker supplied to augment basic cooking facilities ( 2 plate oven/stove) Fully equipped and serviced. Fresh Spring water supplied daily. Guests who book into the self-catering units are considered desiring of being left alone. Apart from servicing of units, which is always done in a discreet manner and at a convenient time, this wish is respected at all times. Full modern kitchen with gas oven / stove as well as a microwave. Lounge area with hi-fi and heater. Private patio and braai facilities in a walled courtyard Orchard / garden featuring a pair of mature walnut trees. This unit is under ceiling and suitable for longer stays. Fresh Spring water supplied daily. The Village of Hogsback is tucked away high up in the Amatola Mountains of the Eastern Cape Province, about 1300 m above sea-level. It is easily accessible by road from East London to the east (about 1 ½ hours) Port Elizabeth to the south-west (approximately 3 ½ hours) and Queenstown to the north (about 2 hours). Hogsback developed around the establishment of Lovedale College in the early 1800’s. To the missionaries of Tyume valley and the town of Alice, the area on top of the mountain was attractive in the summer months as a cool refuge from the sweltering heat below. They would hitch up their ox-wagons and remove their entire households to the forested mountains for a period of rest and quiet respite. The journey would take 5 days from Alice to Hogsback. These days it is easily and quickly reached by car, but the purpose for the journey remains the same. Do not expect to find much in the way of infrastructure. The streets of Hogsback are gravelled, or at least, once were. There is a little, basic Village grocery shop, a bottle-store, a postal agency, and a Pub. A few independent eateries have sprung up in recent times, making it possible now to eat out, should one choose to do so. Despite the allocation of electricity, cell/mobile phone reception, telephone lines and municipal water supply to the area not too long ago, some or all of these services fail on a regular basis. The many back-up systems required to create independence are beyond the reach of most of the good folk attempting to provide for the requirements of travellers. Municipal delivery of anything which would usually be considered the right of a tax-payer is something we constantly and stridently continue to lobby for. All that you will experience is harmless and could be quite an adventure if you are prepared to view it as such! In short, what we have here is a modern-day pioneering territory. Those of us who have lasted long enough to still be offering services to the travelling Public, despite these frustrations, are necessarily possessed of a sense of humour rare in such concentration elsewhere. Off the beaten track and tucked away, it is also a place of utter relaxation, peace and tranquillity. Very few other places will so quickly impart the sense of being in harmony with nature. During Spring sudden thunderstorms often occur and are of quite terrifying magnitude. This is also the Azalea season, when the Village becomes a kaleidoscope of vibrant colours, attracting gardening enthusiasts from all around the world. Summer is often heralded by the most elegant and gentle of swirling mists which, once experienced, will remain in your consciousness forever. Autumn brings out the wondrous colours of deciduous trees seldom seen elsewhere in this country and the cooler temperatures make hiking at this time a pleasure. Winter snows and frosts create the opportunity to enjoy cosy log fires, warming foods and good red wines. Thanks for a lovely stay. The garden is a delight. Thank you for a lovely stay. It felt like an escape from our normal busy world. The china tea cups in the room bowled me over – wonderful! Thank you for a lovely stay. Breakfast was amazing! A wonderful home and beautiful garden. Thank you! 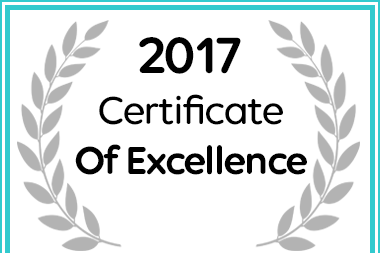 In recognition of exceptional service Granny Mouse House in Hogsback has been awarded a Certificate of Excellence. Amazing Hideaway! Congratulations on your fabulous garden & thanks for your hospitality. This has been a delightful stay at Granny Mouse House. – welcoming and very calm and relaxing. Will certainly recommend to others – a lovely place to visit and a lovely place to stay. Friendly and hospitable, will be back! Thank you. Thanks for a good stay. Breakfast was amazing. Een pragtige locatie en een fijne ontvangst. Super Dank! Ingrid, it was great to be back Thank you once again. We will spread the word about your wonderful hospitality! Thanks for a wonderful stay at this amazing place, we will always come back. Very beautiful and relaxing. Jesse & Simba are awesome. Warm and friendly, great welcome and was a lovely stay with friendly staff and warm clean bedding. Thank you for your hospitality, Ingrid. This place is a gem! We loved our stay with you. Thank you, Ingrid, for the opportunity to stay with you and enjoy your beautiful garden and home. There are no words to describe this piece of paradise. Not forgetting Simba and Jessie. We had a thoroughly enjoyable weekend – thank you Ingrid for your warm hospitality and a championship garden plus comfy warm accommodation. Comfortable bed, delicious breakfast and amazing places to see, I thoroughly enjoyed the classical music! Tranquillity is very rare – this is a lovely place to relax and find yourself. Great hospitality – THANK YOU. The perfect place to go hobbit hunting. Thanks Ingrid! Peaceful and friendly place. A loving and cosy atmosphere – THANK YOU so much. By the way. Great great breakfast. What a wonderful place. Really relaxing and just what was needed. Thanx for everything we will be back. Unbelievable stay. 8 nights supported by nature, two beautiful dogs, great service and Ingrid our impeccable host. Thank you for what you did for us!! Soon !! In addition to the incredible discounts on offer, we will spoil you with our full English Breakfast, made to order. The standard hot breakfast selection of eggs, bacon, tomato, sausage, and fried mushroom is augmented by a pot of French Press coffee or a selection of tea’s, a fresh fruit basket, homemade Muesli with yoghurt, stewed fruit and wholesome muffins.